Need help eliminating your debts? Ready for Zero? Toshl helps you take control over your spending, so you never get sucked into a debt spiral. But what if you’re already in it? No need to panic, here’s a cool app that can help you get back to zero and beyond. 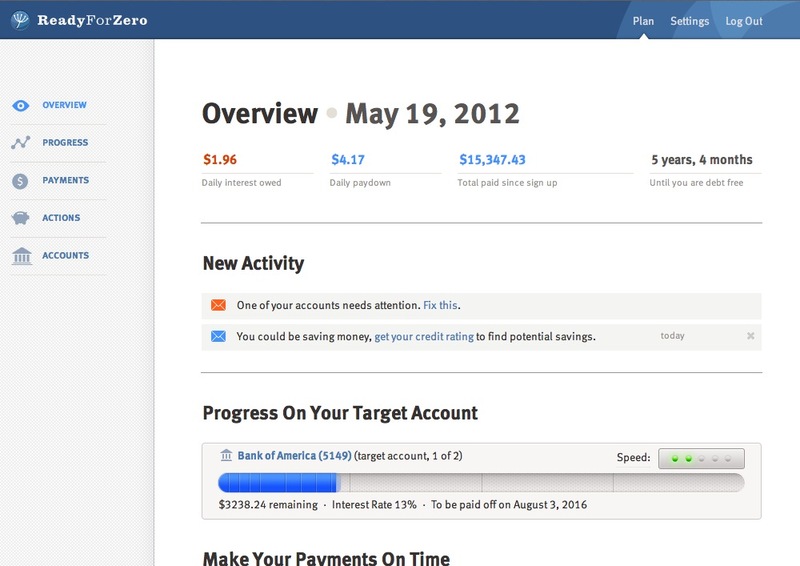 ReadyForZero is a free service that helps you plan your way out of debt. Here at Toshl we like it a lot as we believe it shares some of our core design values and also complements our service nicely. Here’s how it works. Upon sign up, you securely link your credit card or loan accounts and all your debts are imported automatically. 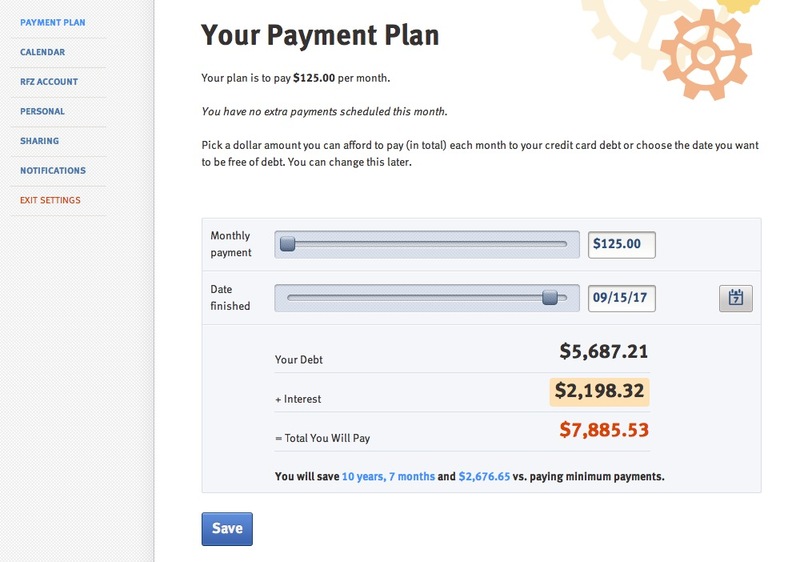 Then you are presented with a nice and easy to use interface where you create your optimal plan to pay off your what you owe. Based on how you set your monthly payment, the app calculates the total interest you will be paying and how much you will be saving compared to if you were only paying your minimum payments, as well as how much sooner you will be debt free. You wouldn’t believe how big a difference even a small adjustment can make. Woohoo, I’m saving $2676 dollars! Now I can go buy myself the new iPad! Not so fast, my friend, deciding on a plan is only the beginning. 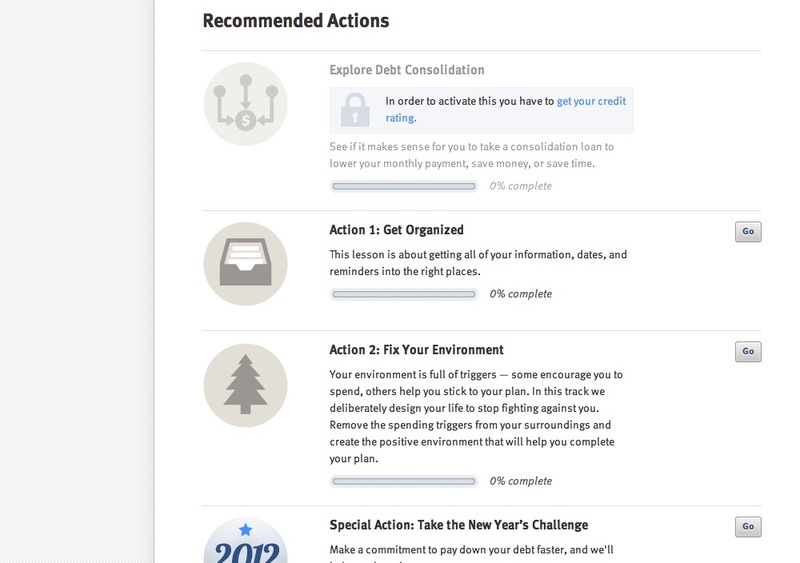 To make sure you fulfill on your resolution ReadyForZero sends you payment alerts, weekly emails, tracks your progress and even suggests concrete actions that can help you towards reaching your goal like “explore debt consolidation” or “stop using your credit cards for everyday purchases”. One to add to the list: take control over your spending with Toshl. And another one: wait a while before buying that iPad. ReadyForZero already helped many people. You can read their stories on their blog. The amount of consumer debt in many countries around the world is at alarming rates. In United States alone, the total consumer debt is nearly $13.22 trillion. That’s $42,500 debt per person. ReadyForZero seems to be determined to bring that number down. Recently they also launched a petition to Congress to not increase interest rates on student loans. We support you guys! ReadyForZero is available on the web and now also on the App Store, currently only in the United States. If you can, certainly try it out and let us know what you think! We all know friends and money don’t mix, but sometimes there’s simply no other way. When that happens, it’s important you keep good track of everything you lend or borrow so you can settle all the debts as soon as possible and keep the trust strong. Here’s how Toshl can help you with that. Let’s say you go for a drink with your best buddy Joe. As always, you have a lot to talk about and the drinks keep coming. Everything’s just great until the gigantic bill arrives and Joe tells you he forgot his wallet – again. C’mon, Joe, seriously? You’re not getting away with it this time! Fire up Toshl and add another expense for the amount you lent. Tag it with your friend’s name and a separate tag you name something like “lent”. Do this every time you lend money or pay for somebody. You can then see exactly who and how much they owe you if you go to Expenses, swipe left to see the tag view and check under “lent” tag. To see the list for a specific person check under tag with his or her name. Since Toshl also saves the date and location for each expense, you can easily refresh your friend’s memory when you remind him to pay you back. When he does, simply delete the expense. Now how about if you’re the Joe in this scenario. Best advice: don’t be. But if you can’t help yourself Toshl can at least help you to remember what you owe so you don’t forget to pay it back. The idea here is similar only this time you add another income. Tag it with your friend’s name and “borrowed”. To see everything you owe check under “borrowed” in the tag view of your incomes or look under a particular name for a more specific list. When you pay someone back simply delete the income. In future versions of Toshl, we plan to make this interaction even more elegant, but don’t use this as an excuse for not paying back what you owe right away. Money’s good to have, but friends are even better.